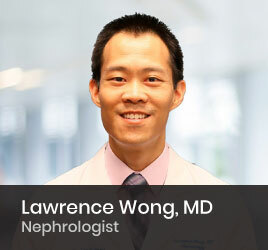 Dr. Wong was appointed Chief Fellow during his nephrology training. Prior to joining Florida Kidney Physicians, he was a member of Tampa Renal Physicians, which he joined in 2007. He is a key member of the Florida Kidney Physicians Ambulatory Operations Committee, where he assures the quality and productivity of our outpatient clinics. He serves as Medical Director of DaVita Carrollwood Dialysis Unit, where he oversees the in-center hemodialysis program.